CBHE was saddened to hear of the passing of ringer Amy-Leigh Mack on Monday, July 24. Amy-Leigh played in the Charlotte Bronze Handbell Ensemble and also served as our Librarian. We will miss our dear friend, fellow ringer, and dedicated supporter. For the full obituary, please click here. On Monday, June 26, Charlotte Bronze Handbell Ensemble is excited to perform at the Opening Concert for Junaluska Music & Worship Arts Week. The concert takes place at 7:30pm at Lake Junaluska, 20 Chapel Drive, NC 28745. The Charlotte Bronze Handbell Ensemble is excited to announce three Spring Concerts, featuring the theme Latin, Jazz, & Blues! All concerts will welcome guest handbell conductor Carlos Rivera from Puerto Rico and guest soloist Lady D from West Virginia. All concerts are free and open to the public! Join CBHE for a Handbell Workshop! Charlotte Bronze is hosting a workshop for you and your handbell choir on February 25th! This workshop will take place at St. Luke’s UMC in Hickory and all music will be provided for you on the day of the workshop. That means you don’t have to take time teaching it to your choir before you come! Let us help you get started on music for Lent and Easter while also reinforcing good handbell technique for your entire choir. CHBE ringers will be on hand to give individual assistance, as well as group help if needed. If you’ve never rung under the direction of Tim Waugh (or even if you have! ), we encourage you to join us! Charlotte Bronze Handbell Ensemble will be hosing Spring 2017 Auditions Part Deux on Monday, January 30, 2017 at First Methodist Church (501 N Tryon Street, Charlotte, NC 28202). Please contact CBHE President Tina Davis at president@charlottebronze.org for more information about auditions! Giving Tuesday & Amazon Smile: Support CBHE this Holiday Season! With the 2016 Holiday Season coming upon us, Charlotte Bronze would like to offer a friendly reminder to consider the reason for the season! This is a season of giving and what better way to begin the giving season than by supporting the Charlotte Bronze Handbell Ensemble? Your tax-deductible donation would be used to help the group purchase our own equipment and be able to pay for our weekly expenses. Forget about Black Friday and Cyber Monday, remember Charlotte Bronze on Giving Tuesday! Additionally, if you’re shopping online at Amazon for some Black Friday deals, head to Amazon Smile instead! By shopping through Amazon Smile, which offers the same selection and customer services as Amazon, and by picking Charlotte Bronze as your nonprofit organization, Amazon will donate to CBHE with each purchase! Visit www.smile.amazon.com to get started (search for Charlotte Bronze Handbell Ensemble). The Charlotte Bronze Handbell Ensemble will perform their free Welcome Yule Concerts on December 16, 18, and 19. CBHE will perform on Friday, December 16 at 7:00pm at Philadelphia UMC at 1691 SC-160 in Fort Mill, SC. On Sunday, December 18 at 3:00pm, CBHE will perform in Salisbury, NC at Christ UMC at 3401 Mooresville Road. On Monday, December 19 at 7:00pm, CBHE will perform in the sanctuary at First United Methodist Church at 501 N. Tryon Street in Charlotte, NC. The holiday concerts will be directed by Charlotte Bronze’s Artistic Director and Conductor Timothy H Waugh. The concerts are free and open to the public, and families are welcome. A free-will offering will be received to support the ongoing mission of Charlotte Bronze Handbell Ensemble. There is also a concert planned on Sunday, December 18, but the time and location have yet to be confirmed. Check back for updates! Charlotte Bronze Handbell Ensemble is excited to announce that open auditions will be held in August 2016, prior to the start of the fall season. A pre-audition ring through is scheduled for the evening of August 22nd at First Methodist Church in Uptown Charlotte. Auditions will be held the evening of August 29th, also at First United Methodist Church. 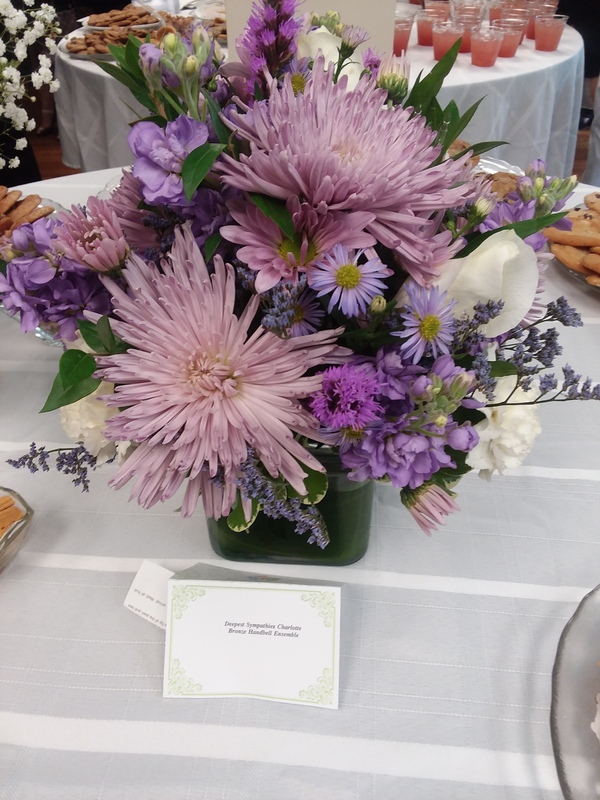 Please reach out to CBHE President Tina Davis for more information at president@charlottebronze.org. CBHE members performing at a holiday concert in December 2015. 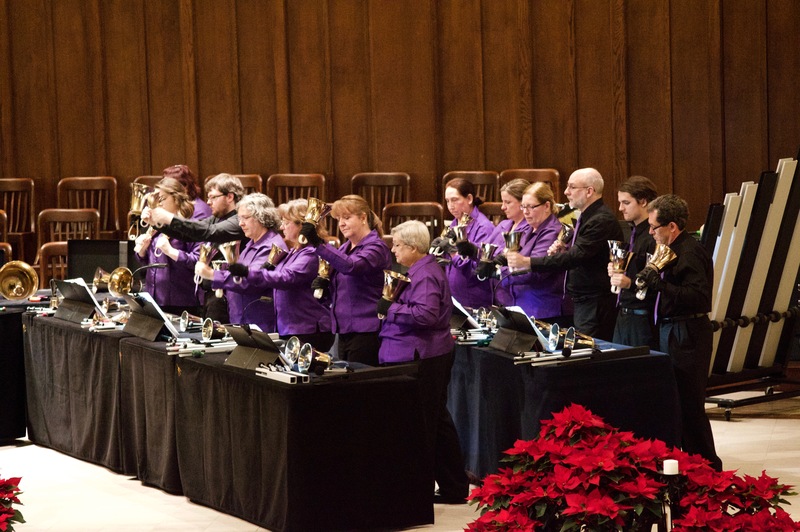 The Charlotte Bronze Handbell Ensemble, the largest community handbell group in the Piedmont, will perform their free spring concerts on May 21 and May 22, 2016. CBHE will perform on Saturday, May 21 at 4:00 PM at North Raleigh United Methodist Church, 8501 Honeycutt Rd, Raleigh, NC 27615. The following day, on Sunday, May 22 at 4:30 PM, CBHE will perform at Pritchard Memorial Baptist Church, 1117 South Blvd, Charlotte, NC 28203. Both free concerts, “Michael the Archangel” will be directed by Charlotte Bronze’s Artistic Director and Conductor Timothy H Waugh. The concerts are free and open to the public, and families are welcome. Donations to the non-profit group will be accepted. The Charlotte Bronze Handbell Ensemble was founded in March of 2011. Now five years old, the group has already performed in many festivals and events in Charlotte and across the state. They were featured at the NC State Baptist Handbell Festival in 2015. In concert, CBHE presents new music, often in manuscript form, by up and coming handbell composers. The ensemble is available for workshops, classes and concerts. Charlotte Bronze Handbell Ensemble is embarking on its very first CD project and we need your help! This CD will include many Christmas handbell tunes and some the group’s personal favorites. Producing a CD takes full dedication of all our ringers and we’ve been hard at work polishing each track. Here’s where you come in! Recording, editing, and artwork are the bulk of our expense and are exactly why we are launching this campaign. Any donation you could give, no matter the size, would be greatly appreciated! We are planning to record in January and will need funds as soon as we begin that process. Please consider donating and supporting our project. This CD promises to be one of a kind! Click here for more information!